It is summer in the London borough of Hackney and the recent heavy rain has made the Manor Garden allotments more fecund than usual. Poppies run riot, jasmine scents the air and fig trees are budding with fruit. Sheds flake, rust and crumble. The make-shift constructions are painter Julian Perry’s subject and obsession. ‘Perry has a feel for inbetween zones, for places were boundaries waver and enclaves are created,’ wrote the critic William Feaver. For the past two years he has driven up through the surrounding no-man’s- land of Balaaj Spare Autos, Club Desire and a bus depot, to enter the enchanted land across the River Lee to paint potting sheds. By the time you read this, however, an Olympic ring will have sealed the area and bulldozers moved in to flatten the sheds. The allotment holders’ resistance has proved futile. Perry is ambivalent. Despite using them as his subject, he says, ‘I find the whole English obsession with sheds faintly annoying’. After spending time among the plots of Manor Gardens, it was the sheds that had him hooked. Their structures captured his imagination, and he says that in addition to what they represent, he is ‘interested in them as sculptures’. To home in on this architectural element within the landscape is a departure for Perry. The sheds are abstracted from their environment and painted in meticulous detail, paying homage to their textures and construction. ‘By editing,’ Perry says, ‘I can distil what they are, which is the opposite of what’s coming. They’re about individuals, often made on a tight budget as opposed to the international money and glamour of the games.’ However Perry simultaneously resists sentimentality. Removing them from the landscape which is inescapably idyllic, and letting them stand free-form on often dark canvasses, imbues the images with a certain coldness. ‘The sensibility is not about the picturesque, it’s about this phenomenon – looking for emblematic and significant images,’ he says. The Greenhouse Shed for instance, comprises turquoise painted corrugated iron, a mottled glass door and elegant Art Deco-style window frames, which lets the light flood straight in. ‘It’s a complicated amalgam of recycled materials and patterns, and it’s rather precarious,’ Perry says. ‘I like the colour and the glass – most of the sheds are opaque, but this one has the sun shining through.’ On a technical level the range of surfaces appeals to Perry. ‘I enjoy the contrast of elements that stretch me as a painter – asphalt, rotting wood and plastic. There’s also a pleasure of recognition for the viewer. If something has evidence of time, it enables you to travel back too.’ The tangibility of paint prompts the viewer to look at an image afresh. It invokes an awareness of materials that is experienced most intensely and directly in childhood. Indeed Perry refers to the Ladybird book series as something he admires for illustrating the everyday. What Perry has done is take elements of Manor Gardens’ world – the sheds and the veg, and turned them into their own worlds. He has painted not only the decaying buildings, but also the flourishing fruits of each allotment-holders’ labour. The painter John Craxton has highlighted this quality in Perry’s work before. ‘ When he stumbles on a collision between industry and Arcadia…he gives [it] an uncontrived enigma,’ he wrote. Giant rhubarbs as seen from a snail’s perspective sprawl towards the viewer; reality is magnified to the point of surrealism. The contrast between that which is thriving and crumbling is stark. It is brought head-to-head through the paintings’ semi-religious diptych arrangement, where sheds and plants pair up. Monster rhubarb is to be bolted onto Shed 54, a compact cuboid shape that looks sturdy and self-contained, despite being patched together with corrugated plastic and asphalt. The abstraction of both from their environments belie the political context in which the nurtured structures and plots are subjects of forcible eviction. A transformation has occurred. The improvised structures of the sheds, in a mish-mash of materials, so rooted in their environments, are depersonalised. To create a new life and form for a subject is the artist’s prerogative, and where Julian Perry and the allotment owners find common ground. For making one’s own world, in which the microcosm is more real than the wider world, is what allotments and sheds represent too. The Olympics stands for extreme realities and ideals – the quickest, the strongest, the fastest. 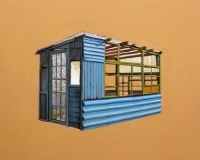 But as representations of textures, fertility, growth, personal idylls and peace, Perry’s sheds will be aliens from the past, drifting in their own private, painted space.